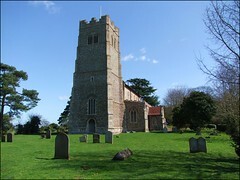 Suffolk has few grander sights to offer than St John the Divine on its hilltop, the barley fields falling away below it. 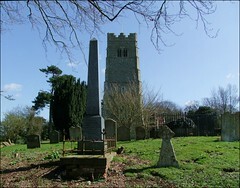 A landmark for travellers on the A14, and seen with particular force when approached from Tostock, it is among the county's mightiest towers. 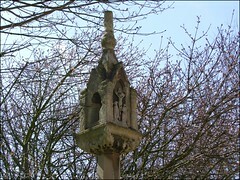 St John's story is one of a typical country parish, with all the drama, changing fortunes and swings of the liturgical pendulum over the centuries that this implies. 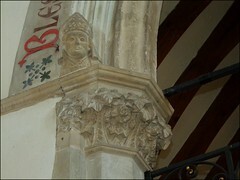 The architecture is rich in evidence of its late medieval life. Wills expert Simon Cotton tells me that the tower is almost certainly by the same architect as Ixworth and Badwell Ash, which were both built from bequests during the 1470s. 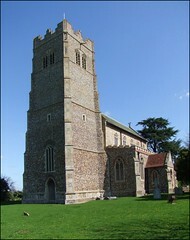 In the 1460s, thissame architect had cut his teeth on the tower of Garboldisham, in Norfolk. There is an inscription on the south east buttress, the name of a man who was an incumbent in the late 15c, at the time it was built: Syr Wyllm Maundevyl. So he was probably a donor. In 1476 , the will of Margaret Walter left 40 shillings for the fabric of the new tower, so this dates it reasonably well. Forty years earlier, the monks of Bury had entertained Henry VI here, and this was a Benedictine foundation. The ancient way between the Abbey and this church still survives in part, in nearby woodland. What we see externally, apart from the tower and pretty red-brick decorated clerestory, is largely 19th century, for this church was in a bad way by then. This is all set in a delightful graveyard. 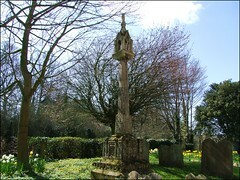 It was closed for burials in 1900; it isn't huge, but has a large number of 17th and 18th century graves still in situ, particularly to the west of the chancel, including plenty of Catchpoles and Garrards. 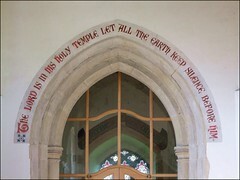 Entry is through the south porch, which has 17th century grafitti on the inside of the arch. 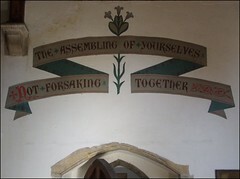 This is upside down, telling us that the outer arch, at least, has been dismantled and rebuilt at some time, probably during the 19th century. The first impression on stepping through the doors is one of light and space. 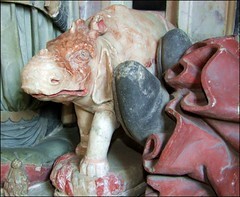 This is partly a result of a good conversion of the west end of the nave. Here, the most westerly arches of the arcade have been infilled with a meeting room, topped by a splendid balcony. The whole thing is in light maple and glass, with a curvaceous parapet and spiral staircase. If you walk through the meeting room, you'll discover that the area beneath the tower is now fitted out for the Sunday School. It is all done very well indeed, an example of how a medieval building can be adapted for modern use without losing its integrity. There is something similar at Rougham, although not as brave, or as impressive in that mighty church. Above the arcade, a splendid medieval string course of fleurons spreads eastwards, but this church is essentially a 19th century interior. 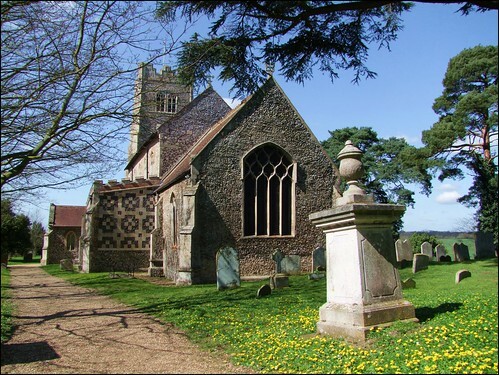 We may assume that, in common with many rural Suffolk churches, St John was pretty much derelict by the early 19th century. The evangelical movement of the late 18th century had seen revival and renewal in many places, but mostly in the urban areas. It did not always filter out into the country parishes, where the absentee Rectors we love so much in Trollope often left the day-to-day pastoral care of their parishioners to impoverished curates. Many congregations had, not unreasonably, detached themselves from the established church, and found comfort and excitement in the non-conformist churches. 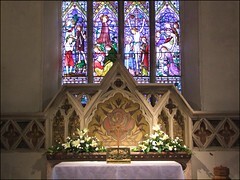 It took the full force of the Oxford Movement in the 1830s and 1840s, and the consequent rebirth of the CofE as a national church, to revive the care of the medieval churches. Ironically, the Victorians are all too easily blamed for 'destroying' medieval churches with their restorations. Here at Elmswell, we can see the extent to which they actually saved one, as in so many other places. 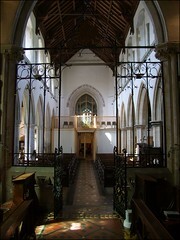 Three separate restorations in the 1860s and 1870s gave St John the shape it has today. In 1862, E.C. 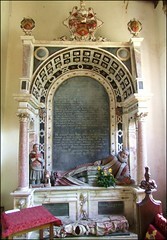 Hakewill rebuilt the south aisle, accomodating the Gardener memorial (to which we will return) which remained in situ. Hakewill was an enthusiast for north aisles, but it was not until 1867 that J.D. 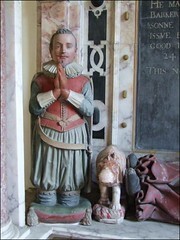 Wyatt added this to balance the space across the nave. 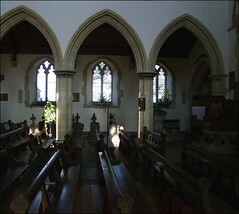 And then, R.J. Withers completely restored the chancel, in 1872. Enthusiastic and knowledgeable churchwarden Jean Folkard sent me an account of the festivities the day the church reopened, from the Bury & Norwich Press edition of 12th November 1872: Revd Wm H Colbeck Luke MA and his family connections, who have since the commencement of his tenure of the living been most earnest and liberal in their efforts to make the condition of the parish church altogether worthy of its architectural pretensions. 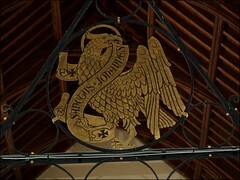 Turning to the east, you see what is perhaps most significant about the history of St John the Divine. In the late 19th and early 20th centuries, it was one of the flagships of the Anglo-catholic movement. As so often, the prime mover was a Rector who was also Lord of the Manor, giving him carte blanche to develop the ideas of the Oxford Movement to their logical conclusion. 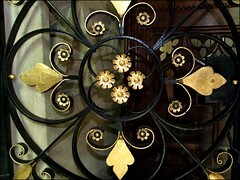 The Reverend WAC Macfarlane was Rector in the 1880s and 1890s; his is the glorious wrought iron roodscreen, the evangelistic symbol of the church's patron on top. 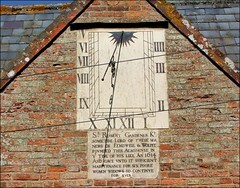 It replaced the remains of a wooden screen that David Davy saw here in 1827. The chancel is arranged for shadowy, incense-led worship, and the turn-of-the-century reredos is gorgeous, with its pelican plucking its own breast to feed its infants. Macfarlane may also be responsible for the stone mensa on the altar, although Roy Tricker tells me that Macfarlane's successor, Father Hipwell, was an even more advanced Anglo-Catholic. 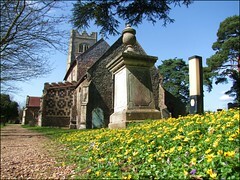 Hipwell had come to Elmswell after curacies at St Stephen, Lewisham, St Paul, Lorrimore Square and St. Augustine, Kilburn, three major Anglo-catholic centres in London. 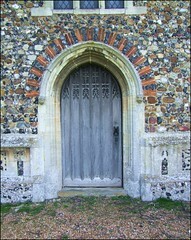 He had also been the Chaplain of the All Saints Sisterhood at All Saints Margaret Street before coming to Suffolk. First, he was Vicar of Leavenheath, and then he came to Elmswell. Roy tells me that, under him, Elmswell was an Anglo-catholic centre of national importance, where advanced worship took place. He had as a curate, from 1894 to 1897, the extreme and eccentric Fr Sandys Wason (whose biography Roy has written) but the Bishop of Ely refused to ordain Wason as a priest unless he gave up saying the Rosary, so he moved to London. 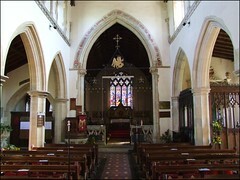 Wason returned to preach in 1901 when the organ was dedicated, at one of the three services held on that day of great ceremony and many clergy. However, like many formerly militant Anglo-catholic churches, St John is today firmly back in the Evangelical fold, with a thriving congregation and a strong musical tradition. Some may decry these restorations. Norman Scarfe, in his 1960 Shell Guide to Suffolk, was rather less than complementary. 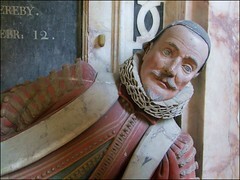 Church ill-kept, utterly restored, full of cheap furnishings, he wrote. Delicate remains of screen, its panels daubed in manner of pavement artist. We'll come back to that, as well. Mind you, this is the same Norman Scarfe's guide which described Shimpling, with its extraordinarily good and early work by Henry Holliday, as containing the worst glass in England. Everyone is entitled to their opinion, but we have moved on since the 1960s, I think. To give Norman credit, when I asked him if he'd write the same thing if he was doing the book today, he thought for a moment and then said "well, I'd have to go back and take another look." 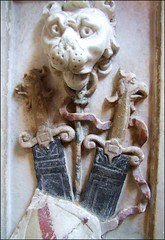 Little of the Middle Ages survived the work of Hakewill, Wyatt and Withers. But probably little had survived anyway. There are several impressive medieval benches, but all their bench ends have been sawn off, leaving castellated cushions, exactly as across the A14 at Rougham. 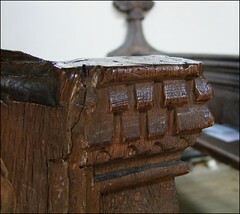 One of the benches has a shield with a mutilated inscription, suggesting that it was a dedicatory inscription asking for prayers for the soul of the donor. It would have been excised by 16th century Anglicans or 17th century Puritans - protestants don't believe in prayers for the dead. But it is too short to be an inscription in its entirety, and it is less likely that such a short excerpt would have been circumscribed, suggesting that other benches bearing parts of the inscription survived at the time. Within 30 years of the Reformation, the new Church of England was firmly in the ascendant. If either Edward VI or Mary had not had such short reigns, or if Elizabeth had not had such a long one, history might have been quite different. 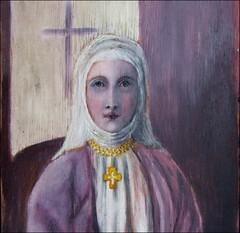 And Elizabeth had a powerful friend in this parish. 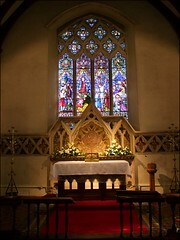 The parclose screen that fronts this little chapel dates from the 19th century, but the one to the north is medieval. Notice how awkwardly it fits into the arcade; could it be that it was moved here from elsewhere during the 19th century, perhaps from where the rood screen is now? But there was a chapel here before the Reformation, because the squint aligned on the high altar still survives. If you go around to the north side, you will see two things.Firstly, the quality of the carving is superb - note the birds in the spandrels of the dado. But the most extraordinary survival is below them. 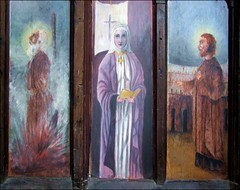 These are primitive paintings of martyrs and saints. The quality is poor (these are by Scarfe's pavement artists), but they date from when the Anglo-catholic revival was at its height in this parish. Where did they come from? It is unlikely that work so naive would have been brought in from elsewhere. Most likely, they were by a local painter. Why are they here? Perhaps it was a backdrop to a display at some Edwardian flower festival, and it was thought so highly of at the time that they were allowed to remain. Indeed, the church guide dates them confidently to 1904, and suggests more than one artist. Or perhaps there is a quite different explanation. They are riveted into place. The overall effect is so awkward that one wonders why they have never been removed. But I'm glad that they haven't. 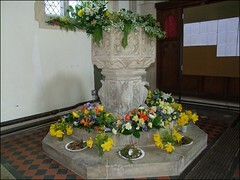 They survive as evidence of local enthusiasm for an exciting time in the English Church. More than that, they are a finger on the pulse of the life of an English country parish. 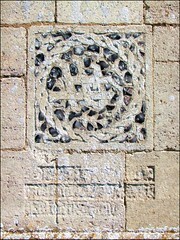 with the original entry for this church, on which this new entry is based.